Browning, Rufus P., Marshall, Dale Rogers, and Tabb, David H.. 1984. Protest is Not Enough: The Struggle for Blacks and Hispanics for Equality in Urban Politics. Berkeley: University of California Press. Sawyer, Mark Q. 2005. 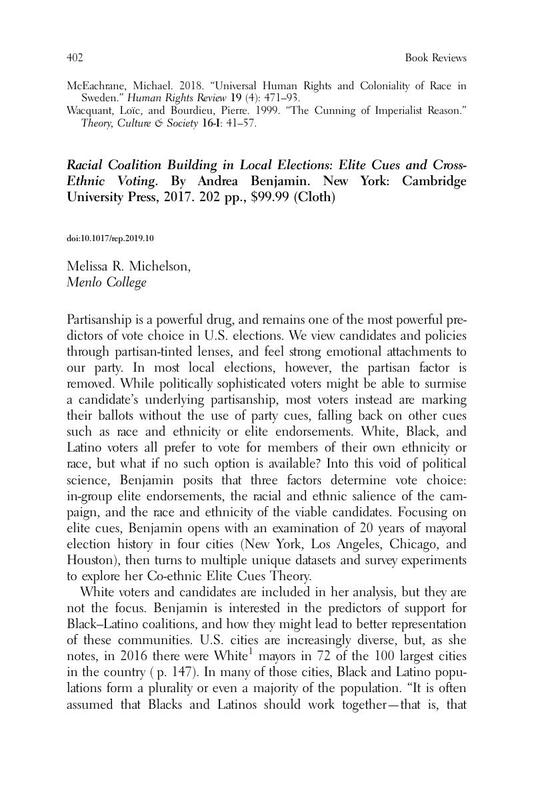 “Racial Politics in Multi-Ethnic America: Black and Latino Identities and Coalitions.” In Neither Enemies nor Friends: Latinos, Blacks, Afro-Latinos, eds. Dzidzienyo, Anani and Oboler, Susanne. New York: Palgrave Press, 265–279. Wilkinson, Betina Cutaia. 2015. Partners or Rivals? Power and Latino, Black, and White Relations in the Twenty-First Century. Charlottesville: University of Virginia Press.